This week I’m taking a break from all fantasy/dystopia reads and settling for something in the ordinary, something that I can sort of relate to. I can’t relate to it 100%, but you get what I mean. 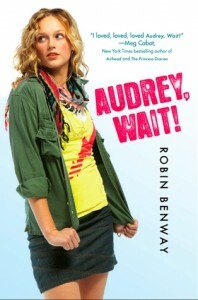 This week’s read is Audrey, Wait! by Robin Benway. Here’s the teaser, one of the funniest parts I’ve read in the book so far. It’s kind of long, but I can’t not share it. Such an inane-sounding conversation, but it’s these parts that make this novel feel real. Don’t you think? What a fun teaser! Here is my teaser. Sounds fun and like a good summer read. Very cute! Sounds like a great read. Oh, I like that! What a refreshing bit of dialogue…. The book seems interesting! Great teaser! I’ve heard good things about this book. I’m glad to hear it is funny! Mine is from The Girl Who Could Fly. I don’t know about you, but I definitely feel the need to frolic :p Hope you enjoy the rest of the book! Sounds like fun. Sometime you need a break from the dystopian books. I love them, but they tend to bring me down. Great teaser! Frolic was one of my favorite words in high school! But that was during the Pleistocene era, of course. Sounds like a cute book – excellent teaser! Hi, Tina! Passed on an award to you. You can find it here.